Direct your distinctive ring calls to the phone(s), fax, answering machine, modem or any device(s) you designate with either product from Multi-Link's SR Selective Ring Call Processor series. Once installed on your home or office telephone line, the SR Call Processor "listens" to incoming calls to determine ring pattern. The SR series is great for separating business from personal calls, fax from voice calls, TDD from voice calls, etc...It can turn your answering machine into a distinctive ring answering machine. 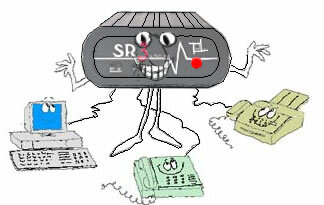 Your fax number rings the fax, your voice number rings your phones, etc...on a SINGLE phone line. The SR2 is designed for the usual two distinctive ring services offered by most phone companies. The SR3 distinctive ring device can process three separate distinctive rings as offered in some enhanced phone services. 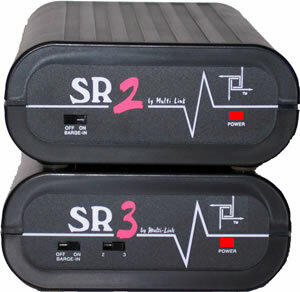 Both the SR2 and SR3 offer a barge-in protection function. All SR products feature the Smartware embedded software that "learns" your phone company's specific distinctive ring patterns.